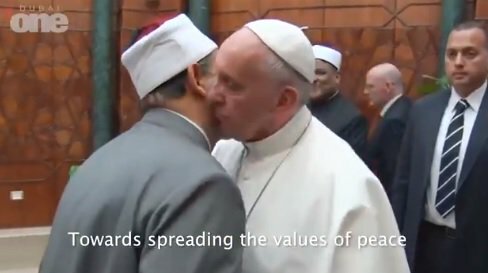 As we see with Francis, the folly of “interreligious dialogue” requires its Catholic practitioners to embrace the unembraceable, just as Francis embraced the co-signatory of his religiously indifferent declaration in the UAE: none other than “The Grand Imam of Al-Azhar [the world’s foremost institute of Islamic studies]” Ahmed Al-Tayyeb, who is on record as having affirmed the unanimous opinion of Islamic jurists that apostasy from Islam is a crime meriting the death penalty in cases where the apostate threatens Muslim social order. And so it is in the UAE, according to Articles 1 and 66 of its Penal Code, which Francis did not seem to notice in his unstinting praise for the UAE and his absurd veneration of the tomb of its founder while standing alongside Al-Tayyeb. Indeed, Francis embraced the “Grand Imam” precisely because the religion Al-Tayyeb represents is false. “Interreligious dialogue” is a programmatic embrace of the unembraceable, including the veritable anti-Christianity that Muhammed invented. It is an insult to Christ and the Church He founded, in which now even the Vicar of Christ participates, and the greatest perversity amidst a swarm of perversities that constitute the current crisis in the Church.